Apparently, I'm stressed. I don't know why this should come as a surprise to anyone I know. With the move to Israel less than a month away, and the fact that I have to be out of my apartment in less than 2 weeks, time is ticking and there is lots to do. But according to my friend Ari, I "haven't been my usual fun self" these days and that is a concern to me. After hearing that he's afraid to call me for fear that I will bite his head off, I've decided to do something about this excess stress. So tonight, before Jules and I go out to hear Levy down at Cake Shop (more about the show and Levy in tomorrow's blog) I decided to dust off my boxing gloves and sign up for the 7:45 pm class at the NYSC. For 45 minutes, I'll be doing push ups, jumping rope, punching Everlast bags and sparring one-on-one with the instructor. It's an amazing release and now I wonder why I haven't been going these past couple of years. 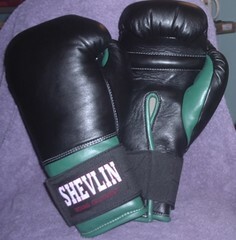 I'm going to have to find a boxing class in Tel Aviv because I'm bringing my Everlast gloves and wraps with me! A few years back, I was an avid recreational boxer. It all started when I represented the agent for Shannon Briggs right around the Briggs vs. Lennox Lewis bout in Las Vegas (Shannon went down early in the fight). After working a couple more fights, including three Mike Tyson bouts (yup, I worked the infamous Tyson/Holyfield fight when Tyson took a big bite out of Holyfield's ear) and a couple with Oscar De La Hoya, I decided to try boxing for myself. Since Gold's gym was in Brooklyn and I wasn't interested in actually getting in the ring with anyone (I really like my nose), I saw that my gym offered non-contact boxing. Every Wednesday night, Craig and Tony would lead our group through drills that would leave me thoroughly exhausted. Craigs was a bit of a metal/alternative rock fanatic and we'd always end the class with a 15 minute boxing routine to Dragula by Rob Zombie. And that's the song of the day.